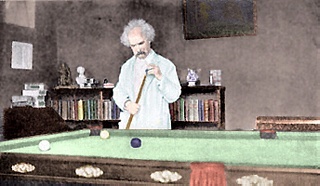 Several years ago, when the internet was still new, I got the bright idea of making a site that was dedicated solely to pool and billiards literature. I surveyed all the available online material, chose what I considered the best examples, and built a webpage that featured them. The resulting site, Ace's Cool Pool Lit & Links, became one of the most frequently visited personal pool pages on the web. Related pages, like my pool and billiards in fine art page, my collection of photos of celebrities shooting pool, and my cue and billiards supply pages all enjoyed first page rankings on the major search engines. Visitors poured in. In fact, so many visitors poured in that my ISP repeatedly threatened to close down my site because my traffic was exceeding their limit. So, I had no choice but to move my site to a new location, www.aceswebworld.com, and to sign up with a new web host. Now, traffic is no longer an issue. The literature presented here in an all new layout has been updated, dead links removed. Hope you enjoy your visit. THE game of billiards has destroyed my naturally sweet disposition. Once, when I was an underpaid reporter in Virginia City, whenever I wished to play billiards I went out to look for an easy mark. One day a stranger came to town and opened a billiard parlor. I looked him over casually. When he proposed a game, I answered, "All right." "Just knock the balls around a little so that I can get your gait," he said; and when I had done so, he remarked: "I will be perfectly fair with you. I'll play you left-handed." I felt hurt, for he was cross-eyed, freckled, and had red hair, and I determined to teach him a lesson. He won first shot, ran out, took my half-dollar, and all I got was the opportunity to chalk my cue. "If you can play like that with your left hand," I said, "I'd like to see you play with your right." "I can't," he said. "I'm left-handed." © 1960 by Gwendolyn Brooks.